The GUKPT hits London at the end of this month with a £100k guaranteed Main Event running June 25 to July 2 at The Poker Room above Grosvenor Casino Victoria on Edgware Road. MainEventTravel.com now sponsors GUKPT’s all-in triangles so look out for them at GUKPT London; the Main Event starts Thursday, June 29. As well as the GUKPT London (Leg 6) £550 Main Event, the schedule also includes the £10k guarantee Mini Main, a £200 NL tourney and £82 Omaha event. This is the GUKPT’s second visit to London this year; in January Michael Zhang won the debut GUKPT of 2017 for a staggering £113,000. The first GUKPT London Main Event was the biggest in the tour’s history attracting a whopping 435 entries. The GUKPT is the longest running poker tour in the UK and now in its 11th season. 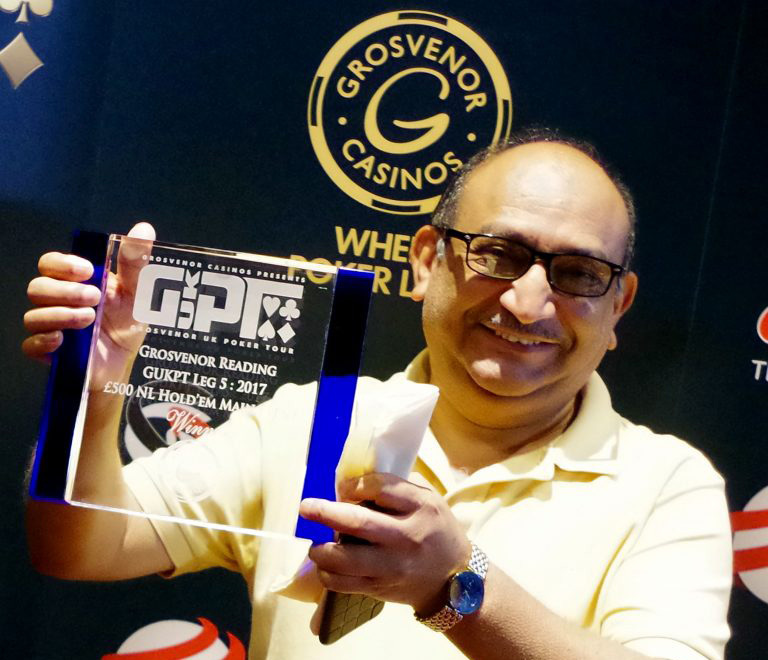 At the last event in Reading, legendary GUKPT Veteran Ali Mallu defeated a 247-strong field in the Main Event for £35,310. It was Mallu’s second GUKPT Main Event trophy, his first being the Manchester leg in 2015. He also narrowly missed winning GUKPT Wallsall after being beaten heads-up by Gareth Howard. GUKPT Passport winner Andy “Logjam” Hills, who took down GUKPT Manchester in March, made yet another final table, finishing sixth at GUKPT Reading for £4,280. He now lies second on the GUKPT Leaderboard behind Martin Holmes. Chris Cooper won the Mini Main for £5,010. Grosvenor Casinos welcomes poker enthusiasts from all across the UK for a week of fun poker action at the GUKPT London festival. As well as the packed schedule of satellites and tournaments, there will be plenty of cash games on offer. Remaining events in the 2017 season are: UKPT Leg 7 Leeds in September, GUKPT Leg 8 Luton in October plus GUKPT Leg 9 Blackpool and the GUKPT Grand Final London in November.